Last weekend I caught a few minutes of an interesting show about the ancient Olympics. The narrator made an interesting point about athletic conditioning, then and now. Back in ancient Greece there were no Bowflex or elliptical machines for training. Those tools were unnecessary because virtually everything back then required physical work. The average citizen's body was probably far better conditioned than his or her equivalent today and the athletes, using stones instead of free weights, were likely on par with today's best athletes. I thought of this as I attacked the snow at the end of my driveway at 4:00 AM this morning. It was the fourth time since yesterday afternoon that we went through the process of shoveling the driveway and walk. The town plows had succeeded in walling us in with icy packed snow but my wife and I, with our ergonomic shovels, have this down to a science and we cleared the driveway in time to catch the 4:30 news. Neither my wife nor I plan to do our usual workouts today. 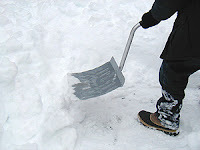 We figured that all that shoveling is a good substitute for the exercise we get on our runs. I felt a kinship with the ancient Greeks who may have helped build their fitness by clearing snow so they could get their chariots out of their garages. That is if they even had snow. Maybe it was volcanic ash. Well, you get my point. 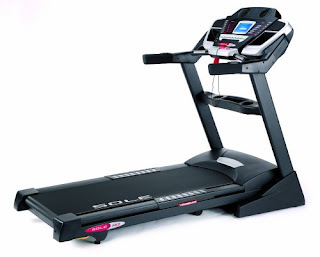 Since this is the year 2010 I have no choice but to rely on fitness equipment for my conditioning. After about 3,000 hours of service it is becoming clear that our treadmill is nearing the end of it's useful life. On the suggestion of fellow Runner's World blogger RunningChick I looked at the Sole models which are highly rated by Consumer Reports. RC and her husband did lots of due diligence before choosing the F80 and they've been very happy with it. My wife and I decided to buy a well rated but lighter duty model, the F63, that has some really great features. I'm excited to get it and we're hoping that our old but reliable (1998!) ProForm L18 will last a few more weeks until we take delivery of the new unit. Aside from the 100+ decibel wailing of the motor it seems to be okay. Great Post. I love how you compare with the ancient greeks. How we, as a modern society, do so many things not realizing how they are done with the ease of modern day appliances, etc. Your post leaves us to wonder. I shoveled yesterday for 2 hours so I think I am good too. Congrats on the treadmill. Hope you get it before the other ones shits out on you. Take care. Thanks - I don't know if my shoveling efforts duplicate those of my daily workouts but at least it forces me to use some sorely underused upper arm muscules. I don't think I would have fared well in ancient Greece!